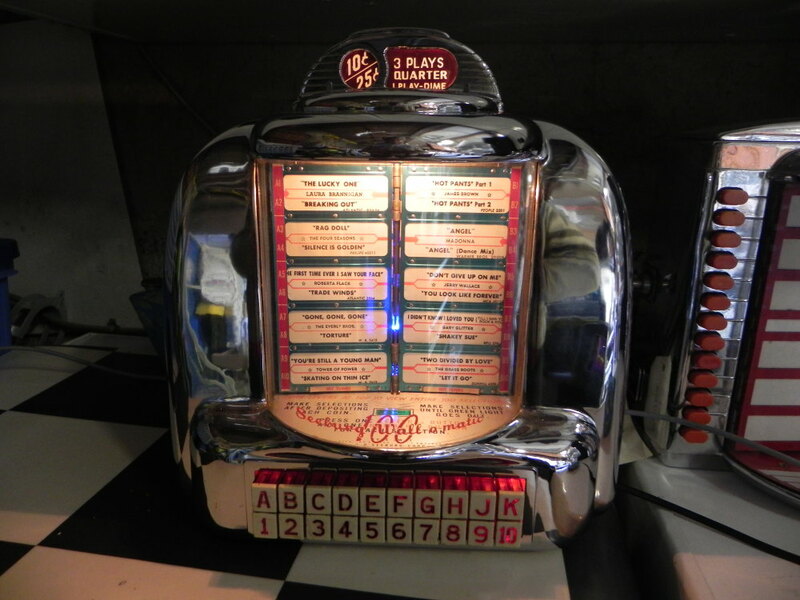 The Wallbox2 MP3 kit recreates the original operating conditions of your Wallbox SEEBURG 3W1 wall-o-matic. The space available inside a 3W1 is limited so we decided to do this tutorial dedicated to the most beautiful wallbox ever. In less than 2 hours you will have achieved the installation of the kit and you’ll be able to enjoy long years of music you have loaded in a single SD card. The description below allows you to mount it inside the wallbox. 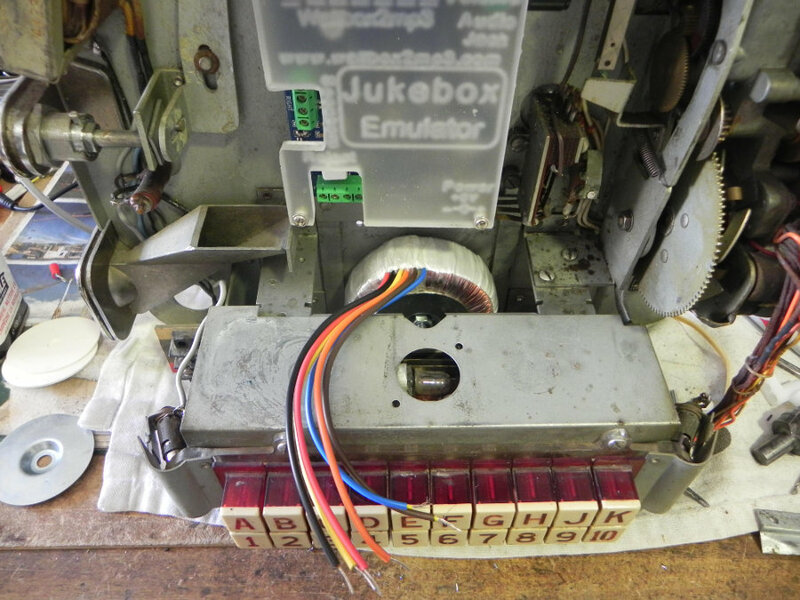 And so your 3W1 become a truly independent jukebox without external card. Spacers ,cover and mounting items. Forest diameter 2.5 mm. / 6.5mm. 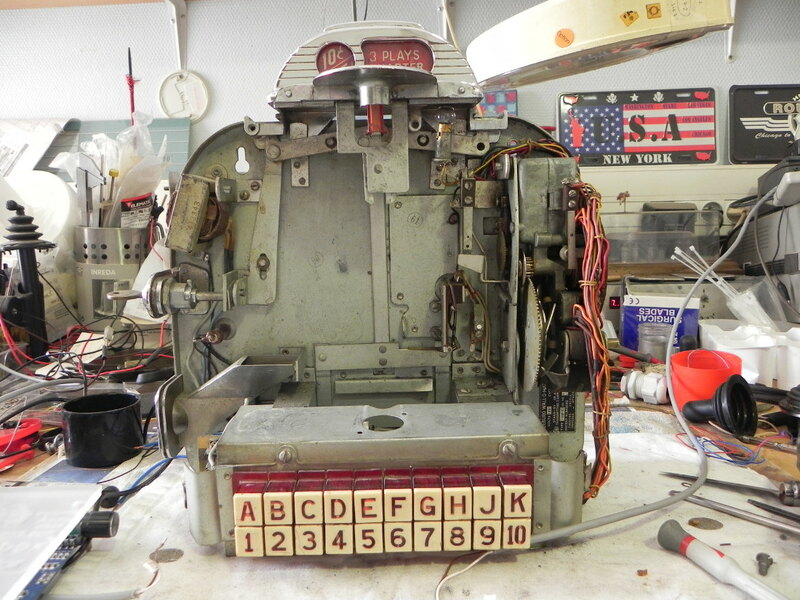 We recommend a complete disassembly and cleaning of the 3W1 before operating. Former potential wiring must be removed from the wallbox. Open and drop on your worktop the content of the wallbox2mp3’s mounting bag. 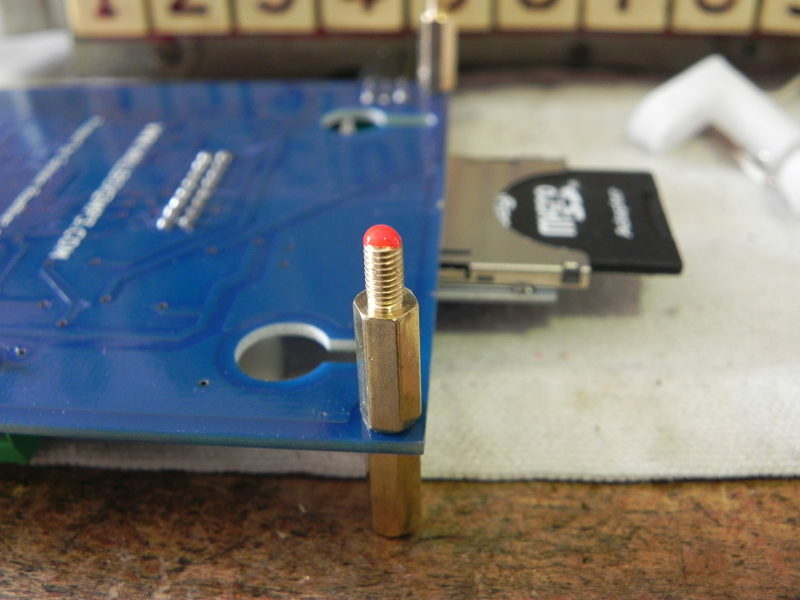 Mount the 4 spacers and screws on the PCB. Put a some nail polish on the tip of the threaded rods to mark the location of the holes. Then tap ( diameter M3 ). Screw the 4 spacers in your Seeburg. Mount the card with the supplied screws, lock moderately. place the transformer at about 1 cm from the bottom. Drill with a 6.5mm /0,25″ diameter forest. Put the screws supplied with the transformer from outside to inwards, place a silicone washer, then the transformer and the second washer silicone, the metal cup, and finally the nut. 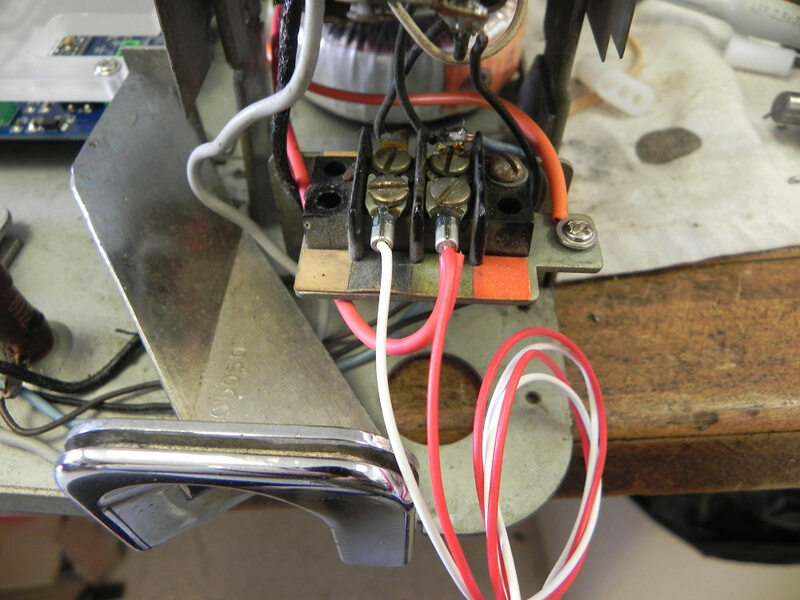 Tighten very slightly with a 10mm / 0,4″ wrench, taking care to center the transformer on its axis. The output is a 12 volt twice that we connected in serial to generate 24 volts. 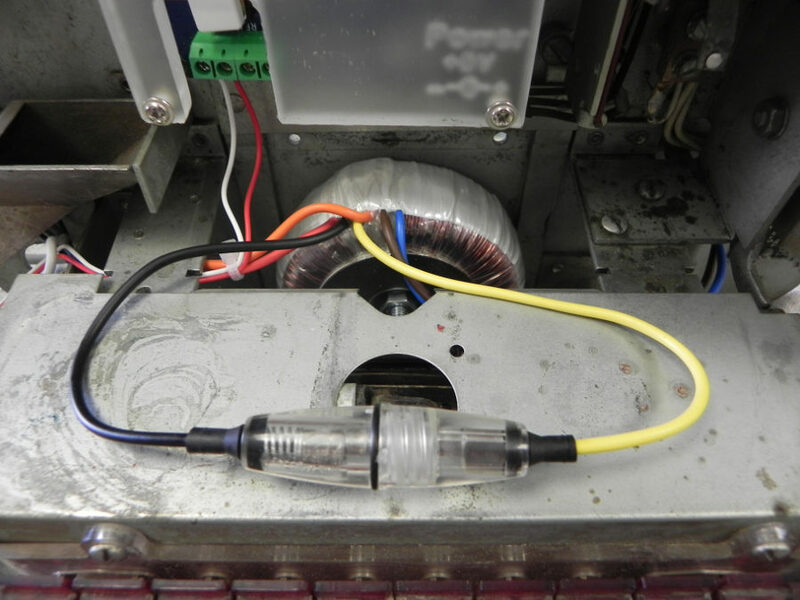 We inserted the fuse holder and the fuse between the two secondary windings. 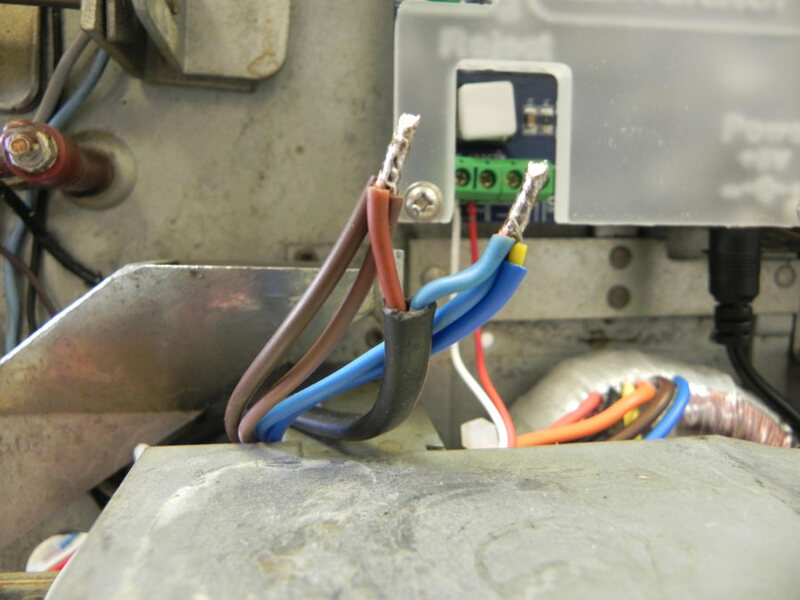 If your transformer has a single output 24 VAC, insert the serial fuse holder on one of the two wires. 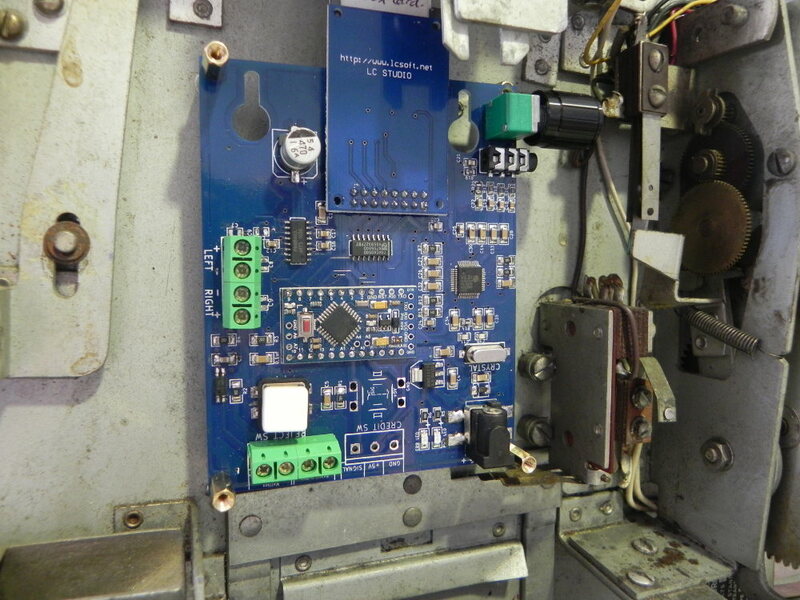 We now have to connect theprimary of the transformer 24 volts,and to plug the 5 V to power the wallbox2mp3. 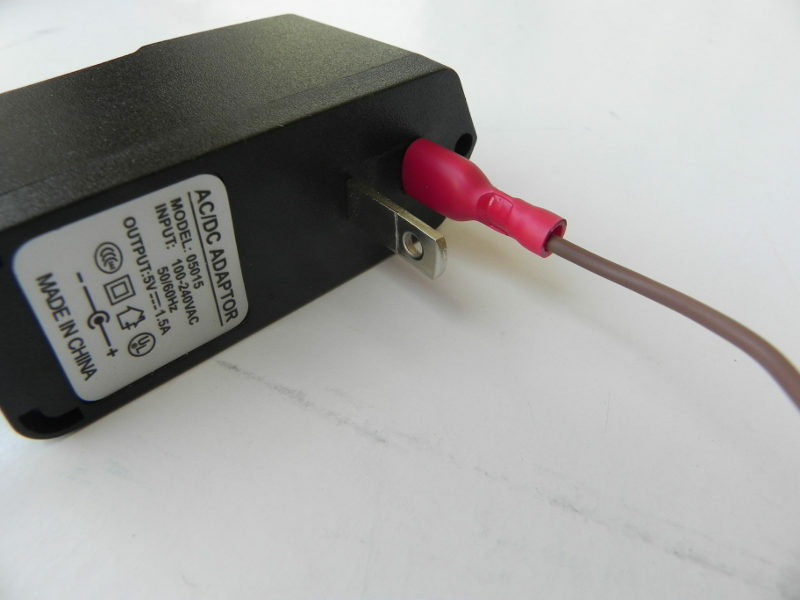 For this we use a tip to use only one power plug to connect to the mains. 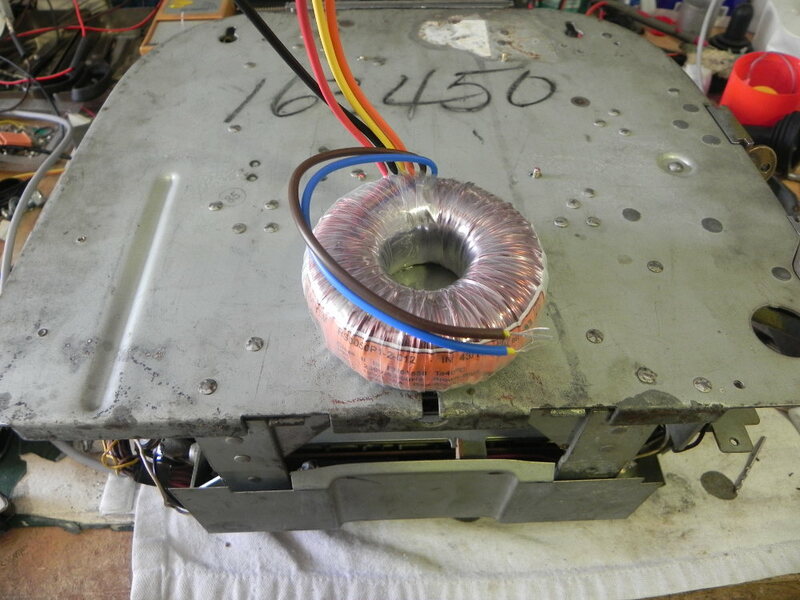 To do this, specify when ordering that you need a power supply with US plug. Crimp carefully wires on females FAST-ON terminals that have to be insulated models. 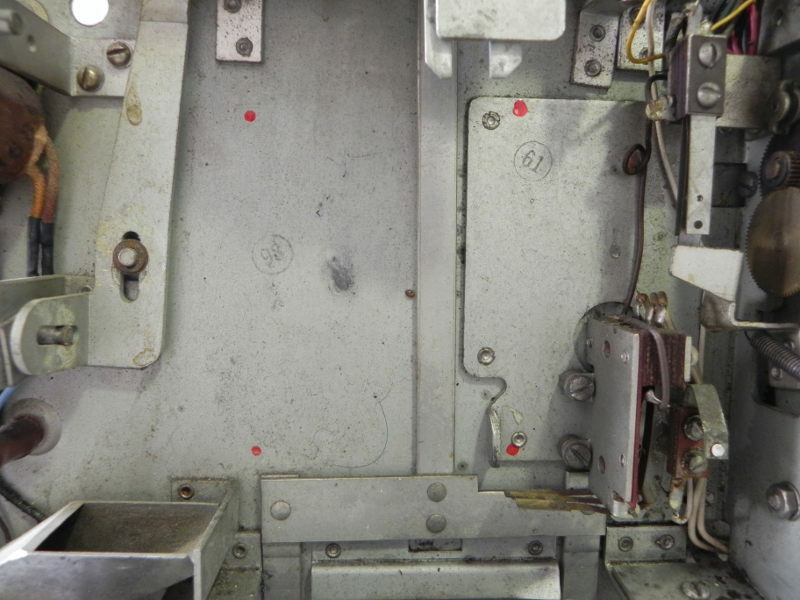 Spread a little inside the terminals with a screwdriver blade to facilitate insertion of the pins of the plug. 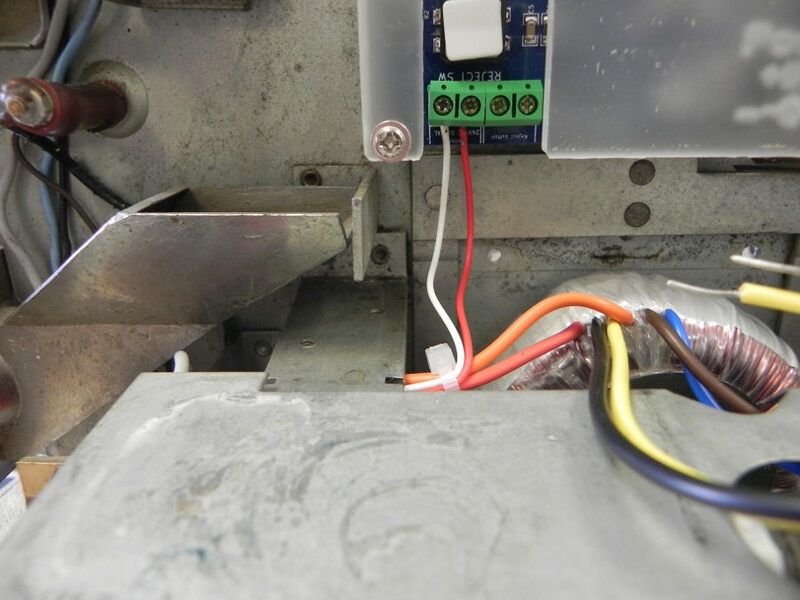 Pull a little on the wires to check that the crimping is good and safety. 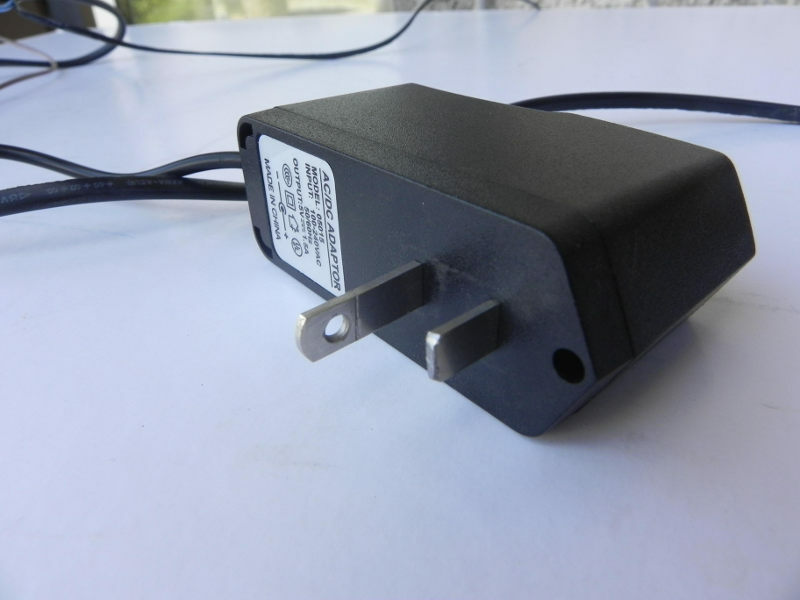 Note: This mounting can be dangerous because you works with AC 220V or 110V depending on your actual country. Fire or death by electrocution risks exist when working on such a current. In case you’re able to this installation, this must be done with great care.The insulation must be perfect, the gauge of the wire must be big enough.you should never work when the system is powered.finally, you should do (and maybe change) the assembly according to the electrical standards in your country. 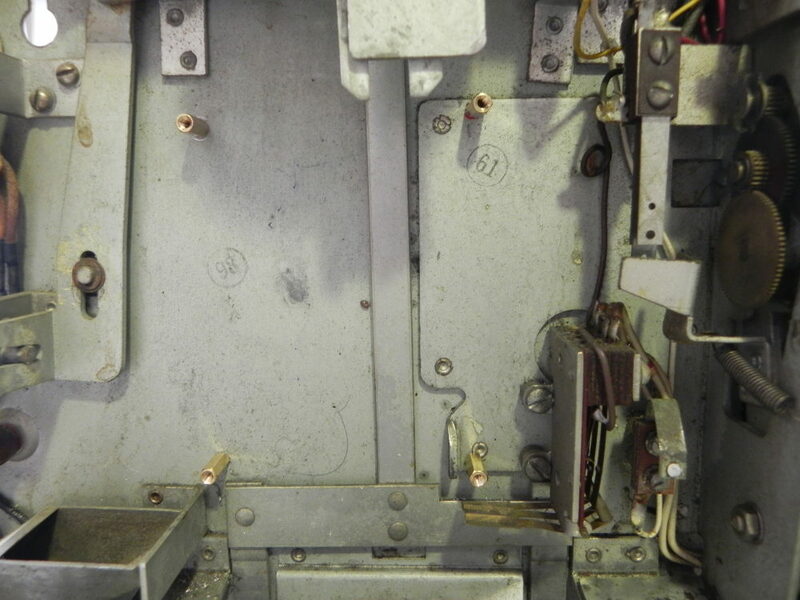 Once said, we can continue working on your wallbox 3W1 Seeburg. 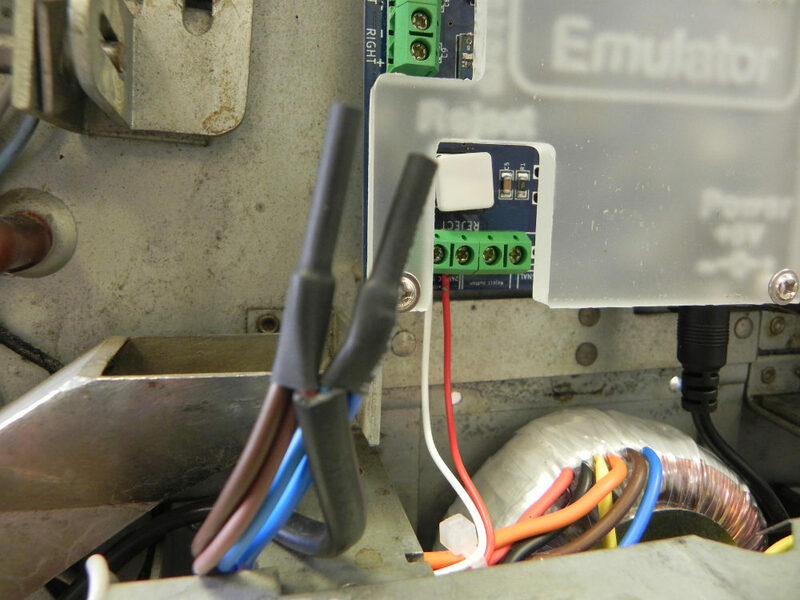 Gather the power of 24VAC transformer’s input with the wires from pods connected to the 5 volt supply, switch the power cord and outlet through the hole at the bottom left of the wallbox. 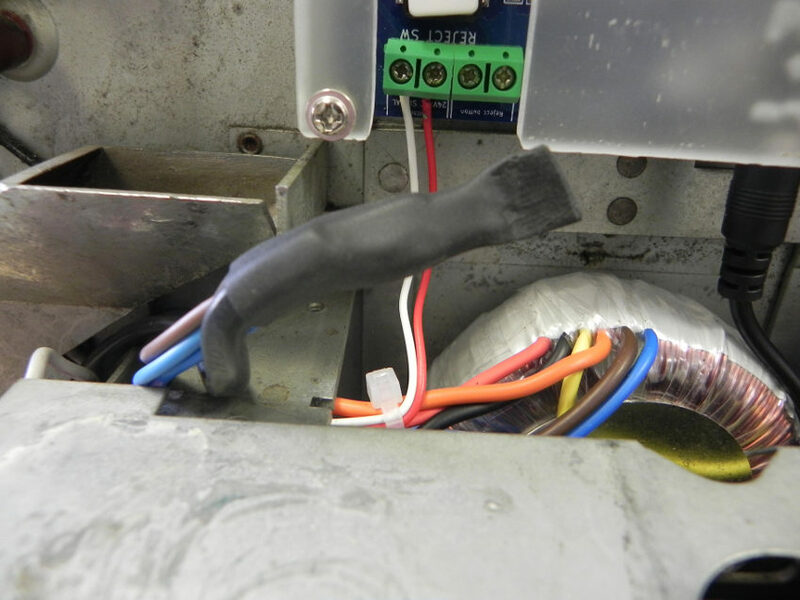 We have decided to weld the wires, and insulate them with heat shrink. covering the whole connection. Pinch the tip before it cools. You will be able to automatically generate tags (title strips) for your selections. You can now turn on your 3W1, and enjoy your work for many years. This tutorial was made with great care. We hope it has given you ideas to complete your achievement. In this case please report them, we will rectify them. In any case, we can not be held responsible for any damage to persons or equipment if we do not directly operate on the equipment. It is your responsibility to assess your skill level, and to achieve the mounting by a professional if in doubt. Wallbox3mp3’s team wishes you to enjoy your wallbox well equipped for years. If you have an idea to contribute to our tutorials,please contact us, your photo reports and videos will be published on our website. The wallbox2mp3 team thanks you for your interest.